Cooler Master has recently released another keyboard/mouse combo so I figured it was time for a CM Storm Octane review for the keyboard and of the mouse as a packaged deal. Cooler Master is at it again. They did extremely well with the popular CM Storm Devastator combo and now they wanted to create a multi color, more modern looking combo of a keyboard and a mouse and in my opinion, they did a really great job in doing so. By adding a few more features and a strong look, they finished out a newer product that may actually be worth its current price point. I’d like to review the CM Storm Devastator. It’s the top selling gaming keyboard on Amazon’s marketplace and I must say that’s it’s pretty amazing, especially for the price point that it is set at. If you’re looking for an entry level keyboard and mouse then this is definitely going to be the right combination for you. 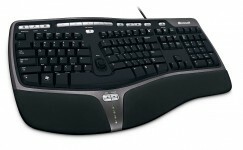 Cooler Master has developed an awesome keyboard and it comes with a mouse… it doesn’t get better than that! Searching the internet for the best computer keyboard for carpal tunnel? Well search no further because your solution is right here! This ergonomic keyboard by Microsoft has a plush hand rest that is extremely comfortable to rest your hands on. The keyboard below here is also designed with an ergonomic curvature to give you a better experience while trying to type with carpal tunnel. The amount of features that this keyboard provides for its price point is pretty awesome and you won’t regret picking this one up over the other keyboards in this market.